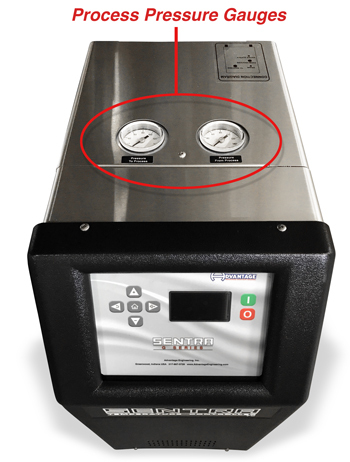 When the Sentra is attached to process to be controlled, with power on, water supply on, pump off, both gauges will read the water supply pressure at the unit’s location. With pump on, the to process gauge will rise to read the sum of the water supply pressure and pump generated pressure. The from process gauge reads the effect of water supply pressure and pump suction pressure. The difference between the to and from process gauges is the pump generated circulating pressure, which is also equal to the pressure drop across the process. 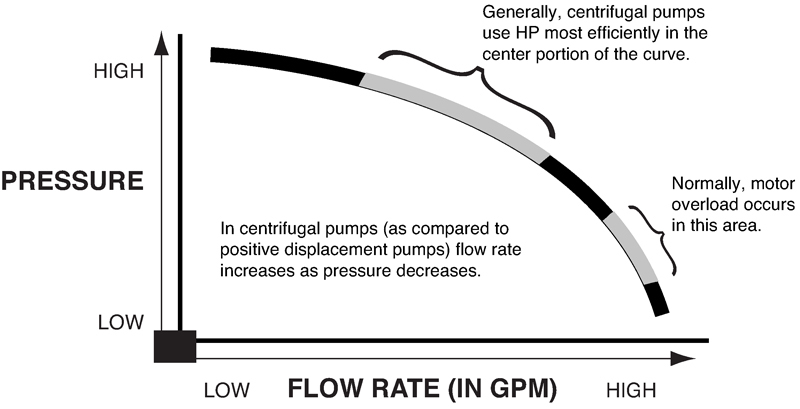 If the pump is running, and both gauges are “close” to same value, chances are that the pump is rotating backward, or the pump is generating such a high flow that an overload condition will result. On competitive mold temperature controllers, when the Δ P gauges are supplied, the water hammer effect of on/off solenoid valves can be seen. At valve open, both to and from process gauges will fall as the system depressurizes. When the valve closes, there will be a momentary spike that will be seen on both gauges, then they will settle back to normal the Δ P values. This spike is water hammer. If the Δ P is low with pump rotating correctly, then the flow rate is high, which probably will result in a motor overload. Refer to the representative pump curve below. Would you like to Download FYI #001 to your browser?